Here are the questions most frequently asked by our patients and their families. If your question is not answered here, please contact us at any of our MRO locations. Radiation therapy is MRO’s clinical specialty which utilizes very high energy X-rays, gamma rays, electron beams, or other ionizing radiation to manage and treat many types of malignancies (and occasionally some non-malignant conditions). Radiation can be administered externally or internally. You and your radiation oncologist will discuss which type is the best choice for you. Radiation works by “ionizing” or breaking apart atoms that make up parts of the cells in the treatment area. Cells exposed to radiation are injured and become unable to reproduce, but healthy cells recover more quickly than malignant cells. The goal of radiation therapy is to give enough radiation to compromise the cancer cells, while leaving adequate healthy cells to repopulate and heal the exposed area. Receiving external radiation treatments does not hurt. It is like having an X-ray. However, you will be required to lie very still and in the same position for each treatment. This is so your radiation therapist can accurately pinpoint your treatment area each time you come in. If internal radiation therapy is recommended, there may be some discomfort when the radioactive sources are being placed. You may be sedated or anesthetized during this procedure, depending on the type of procedure being performed. During my external radiation treatment session, will I hear, see, or feel anything? You will not see or feel anything during the radiation treatment. You will, however, hear the treatment machine make a buzzing sound while the treatment is being delivered. External radiation therapy does not cause your body to become radioactive. You may safely be around other people, even pregnant women, babies, and young children. Hair loss is restricted to the treated area. In other words, radiation to the pelvis or abdomen will not cause you to lose hair on your head. However, if you are receiving chemotherapy along with radiation, you may lose all body hair, including the hair on your head. Not all chemotherapy drugs cause hair loss. In most cases, hair will grow back within a few months after all therapy ends. Yes, you will likely feel tired, especially after approximately your third week of treatment, and tiredness generally lasts until about 3 to 6 weeks after you finish your radiation therapy. Approximately 60% of cancer patients receive radiation therapy. Radiation therapy may be prescribed as your only treatment, or it may be prescribed in combination with surgery and/or chemotherapy. Treatment of cancer with radiation can be costly. It requires very complex equipment and the services of many health care professionals. The exact cost of your radiation therapy will depend on the type and number of treatments you need. Most health insurance policies, including Part B of Medicare, cover charges for radiation therapy. It is a good idea to talk with your doctor’s office staff or the Minneapolis Radiation Oncology business office about your policy and how expected costs will be paid. In some states, the Medicaid program may help you pay for treatments. You can find out from the office that handles social services in your city or county whether you are eligible for Medicaid and whether your radiation therapy is a covered expense. Each external beam radiation treatment session lasts about 5 to 30 minutes. Most of that time is spent in preparation. The actual treatment only lasts 1 to 20 minutes. Breast, prostate, lung, skin, brain, throat, rectal, stomach, esophageal, bladder, and bone cancer, among others. What can I expect regarding side effects? Side effects of radiation therapy are often related to treatment dose and the area that is being treated. Most side effects, although unpleasant, are not serious and can be controlled with medications or diet. The most common side effects are fatigue, skin changes, and loss of appetite. In some instances, overexposure to radiation can cause cancer. However, the therapeutic radiation you will be receiving uses very limited and targeted amounts of radiation, and the risk of the treatment causing a new cancer in the future is minimal. Can I continue to work during radiation therapy? Some people are able to work full-time during radiation therapy and others can only work part-time or not at all. How much you are able to work depends on how you feel. Ask your MRO care team about what you may expect from the treatment you will have. Your body uses a lot of energy to heal during radiation therapy. It is important that you eat enough calories and protein to keep your weight the same during this time. Ask your MRO care team if they recommend a special diet while you are receiving radiation therapy. You may also find it helpful to speak with a dietitian. 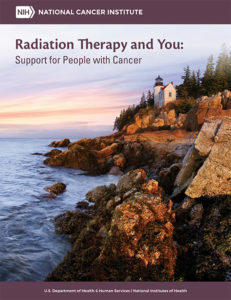 Download the National Cancer Institute’s ‘Radiation Therapy and You’ brochure.